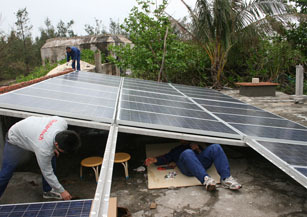 Project Background: At present, with the increase in development activities in the island, people living on the island face a series of problems and the construction of rural infrastructure facilities such as water, power supply systems, roads and living conditions are poor. Freshwater resources are all by rainfall. Because freshwater supply is small, at the same time, the terrain is too steep; the flow is short, so rain-harvesting acreage is limited. 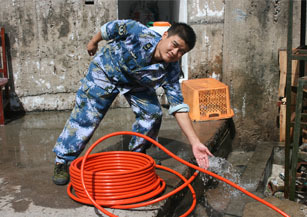 And there are differences between the islands, so the situation of fresh water resources is varied. The problems of uneven time and spatial distribution of water resources, further exacerbate the water shortage. 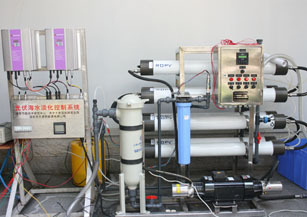 Solution: Adopting Solartech PS5500 and PS3000 solar sea water desalinization system, PS3000 system controls elevator pump, and PS5500 system controls sea water desalination device. 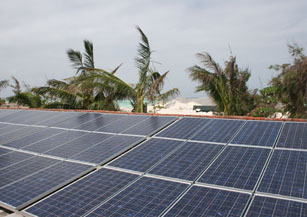 The solar array and inverters drive the whole solar sea water desalinization system independently without any energy storing devices on islands. Economic Benefits: Solar sea water desalinization system would supply 6m3 freshwater per day. The system can generate electricity 1,4600 kWh annually, in its 25-year long application, the system can save standard coal up to 137.2 tons, reduce emission of carbon dioxide, sulfur dioxide, soot and ash by 60.4 tons, 2.75 tons, 2.06 tons and 35.7 tons respectively. Social Benefits: This project solved the problem of fresh water supply on the island over the years, not rely on the water transfer out of island or rain any more.